I kind of feel like I should post now because I'm pretty sure within the next 24 hours my power is going to go out and a tree is going to fall on my house (damn you, Hurricane Irene! ), so I should at least chat with you happily before that happens. The problem is that chatting happily is hard when the thing I have to write about is my kids' open houses—you know, the day they all go find out who their teacher is and check out their classroom. In my mind though, it is really the day all 500 students and their families jam into the school in the same one and a half hours causing my autistic kid to lose his everlovin' mind. That's what I call it. It's not so much a fun day for me. It is also the day when people try to catch up and have small talk and "how was your summer" conversations at the same time as I am trying to keep my kids from running or, at the very least, keep them running in the same direction, and I am pretty sure I sound like a blithering idiot and I know I end up sweaty and disheveled, and it is just not my favorite hour and a half of the school year. At some point during that time in which I had two iDevices and three kids, Jack started stimming and spinning a little and acting, well, like Jack does when he is crazy overstimulated. And that is when I started seeing the looks. They are not mean looks, but they are looks from kids, both who know him and who don't, wondering what he's doing. And noticing that he's different. And not smiling in greeting after a summer away, but assessing and then walking by. I'd forgotten all about that look over the summer. I don't think Jack sees the look, but I do, and it made me a little less excited to send him back to school this year. Thank God a couple of kids who he likes and who really like him are in his class this year. Thank God. After we were released from the PTA table (and by "released," I really mean "as my watch struck my allotted time, I abandoned my post without even saying a word"), we headed to Quinn's classroom first. Quinn's teacher was Jack's math teacher a couple of years ago and I think he might have been more excited than Quinn to be there. I think Quinn is going to love being in her class though. She's wonderful. Plus, she had bags of cookies, so Quinn was delighted. Sam sort of took the lead on helping Quinn with his classroom scavenger hunt. But Jack was happy because he loves the carpet in that room, so it was a lovely little place to take refuge before we headed out into the halls again to find Jack's classroom, which is in a new addition on the school, so hopefully he will be able to find his classroom come Monday. 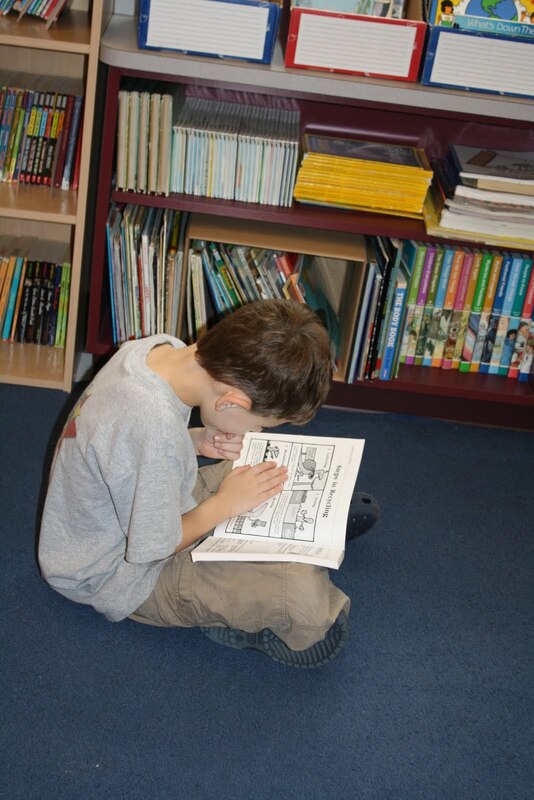 Once we reached his class, Jack sat down quietly and read a book. That kid is awesome. Later, I got to show his teacher what happens when he gets all jumpy and stimmy, which was probably good for her to see, but she also got to see the sweet, calm side of him too. I had created a one-page sheet about Jack for his teacher and she actually read it while I was standing there and then asked questions. She also watched his behavior and asked me questions based on that. This makes me hopeful. Oh, God, please, let her be fabulous. This teacher also had a scavenger hunt. While Jack very literally followed the directions, Quinn created a masterpiece, which he forced me to bring home. It's folded up on my desk. I don't know what to do with it. After that, we headed over to Sam's school, where I was happy to see that there was this little niche in the coat closet where I could stash Jack and Quinn. Things went well at Sam's school, although I am even more stressed out about our transportation situation than before. Come the first day of school, I am going to cross my fingers, close my eyes, put my head in the sand and just hope that all goes well. This is Sam pretending to sleep at his new desk. This is Sam pretending to work at his new desk. Somewhat awesomely, the mascot at Sam's new school is a dragon. And even more somewhat awesomely, they have an ACTUAL PERSON IN A DRAGON SUIT AND THAT DRAGON SUIT HAS A MOUTH THAT LOOKS LIKE IT IS IN A PERPETUAL SCREAM/GRIN/NOSHING ON CHILDREN STATE. I will eat you...nom, nom. At Quinn's request, the dragon even put his mouth over Quinn's head and actually DID pretend to eat him. If only I were quicker with my camera. It was classic. Then we were free. Until Monday, of course, when school starts—or doesn't, depending on hurricanes and power outages. Cross your fingers for us!